Even in software mode it does the same thing. Tested with 1.3.0 (git) and 1.2.1 (stable). Maybe it's just that specific game? Tested with compatibility preset on Safe (fast) and Safest. Hardware is Core i7-4790K with Intel HD 4600, and a Radeon R9 290X (driver version 14.11.2). 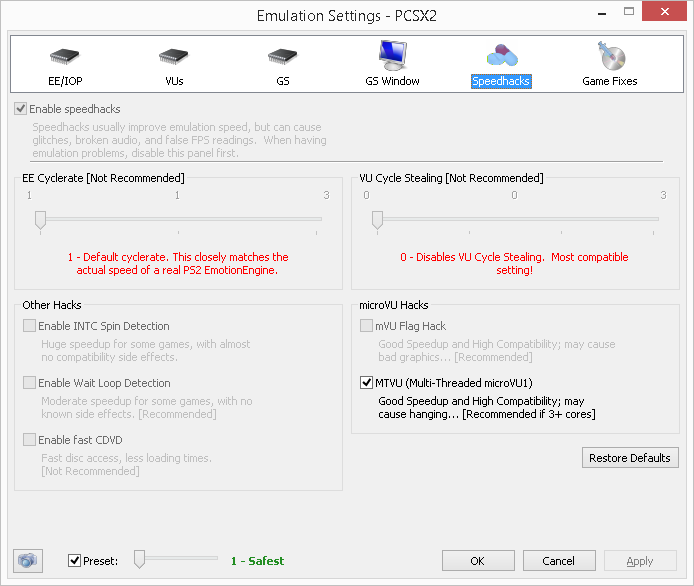 can you post a screenshot of your pcsx2 setting's. and, is there a specific reason on why you are trying the opengl backed. (12-07-2014, 11:22 AM)ssakash Wrote: can you post a screenshot of your pcsx2 setting's. and, is there a specific reason on why you are trying the opengl backed. Me, in the OP Wrote: While investigating another issue I discovered that OpenGL is totally broken on my machine. Well. Testing tonight, OpenGL actually sort of works, but deinterlacing is NOT working correctly, and it actually crashes my display driver randomly! And not after long! Usually within the first 30 seconds of launching a game. The display driver terminating and resetting hangs PCSX2; I have to terminate it in Task Manager. I'm going to try updating to the new Catalyst Omega driver and see if that helps. (12-12-2014, 02:43 AM)auxy Wrote: Well. Testing tonight, OpenGL actually sort of works, but deinterlacing is NOT working correctly, and it actually crashes my display driver randomly! And not after long! Usually within the first 30 seconds of launching a game. The display driver terminating and resetting hangs PCSX2; I have to terminate it in Task Manager. I'm going to try updating to the new Catalyst Omega driver and see if that helps. Catalyst Omega driver installed, OpenGL backend still crashes my display driver. Alarming stuff! (12-12-2014, 03:54 AM)auxy Wrote: Catalyst Omega driver installed, OpenGL backend still crashes my display driver. Alarming stuff! No reason at all for you to be running in native mode (actually some video cards and their drives of today don't like low resolutions) albeit that is not the problem almost certainly. I can't reproduce the problem on my machine (I'm assuming it's not game specific in your case) and nothing in your screenshots points to a configuration mistake. My actual video card is a r9 270x so I can't see how the 290 would be that different relative to OpenGL. The suggestion from ssakash is good but hardly will be the case there since it does not break OpenGL here. Your case is strange and at this point you should be looking the problem at Windows itself instead the emulator. If the display driver is crashing then it's definitely either A. a software problem of the card, aka driver issue. Or B. a hardware problem. My old card started doing similar things where it would randomly crash the driver until eventually I had to replace the card because it was getting more and more frequent. (Which ended up completely solving the problem altogether after it was replaced). So what you should do for now first is just wipe all the current drivers you have for your card, and make sure you download the correct (and up to date) driver version.